Giving back to the community is something the team here at Investment Title feels strongly about. For this reason, we have introduced a new charitable donation program where a portion of gross commissions are donated to local non-profits. 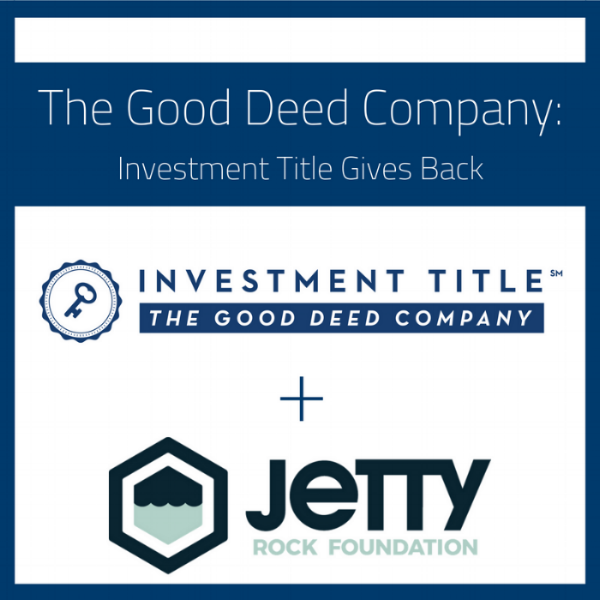 Being that Investment Title is based in New Jersey, we are excited to announce our first partnership is with the Jetty Rock Foundation in the Long Beach Island, NJ area. For those of you who aren’t familiar with the Jetty Rock Foundation, it is the non-profit arm of the Jetty Brand. It was originally formed to provide relief to victims of Hurricane Sandy in 2012. 37,000 primary residences were destroyed or damaged by Hurricane Sandy in New Jersey and now, almost five years later, victims are finally getting back on their feet. Today the Jetty Rock Foundation remains a vehicle for fundraising to aid locals in need and has expanded its focus to bring more art and culture to the area, to provide a scholarship for the local high school, and to create a Future Leaders Entrepreneurship program. Investment Title joins the Jetty Rock Foundation in their mission to help our community and neighbors thrive. Supporting the Jetty Rock Foundation is one of the best ways we know how to give back to our community. Since opening an office on Long Beach Island, New Jersey, employees of Investment Title have seen and heard firsthand about the drastic effects of Hurricane Sandy and its impact on the community. At Investment Title we support education and the influx of culture that the Jetty Rock Foundation is bringing to the shore and by donating, we hope to aid them in making a difference in the shore community. Investment Title is always looking for more charitable organizations to partner with in various regions throughout New Jersey, Pennsylvania, South Carolina and Florida. If you have an organization with an incredible mission contact us today!